We have recently tested a new Shuttle XPC  the SN85G4 model. Don't rush to say there can be nothing new and interesting about Shuttle. First, the model was made for Athlon 64 CPUs, and it was announced at the same time with the line of 64-bit AMD desktop CPUs. Second, SN85G4 has a new case. We will certainly dwell on it in details, as the market prepares for a whole line of the company's barebones ending in G4. Now let us look at the position AMD products occupy on the SFF PC market. So far there have been few models made for Athlon, as about 90 percent of all barebones on the market have an Intel Inside sticker. Even "budget" models  seemingly more suitable for Athlon XP  prefer anything else than AMD. There can be several reasons for this. It may be older Athlon Thunderbirds quickly dying from overheating; or it may be an easily crushing die, or just some marketing issues. Releasing the line of K8 CPUs the company hopes to improve its market status, and we can only wish there was a wide range of barebones for not-burning-and-not-crushing Athlon 64 (and maybe, Athlon 64 FX). 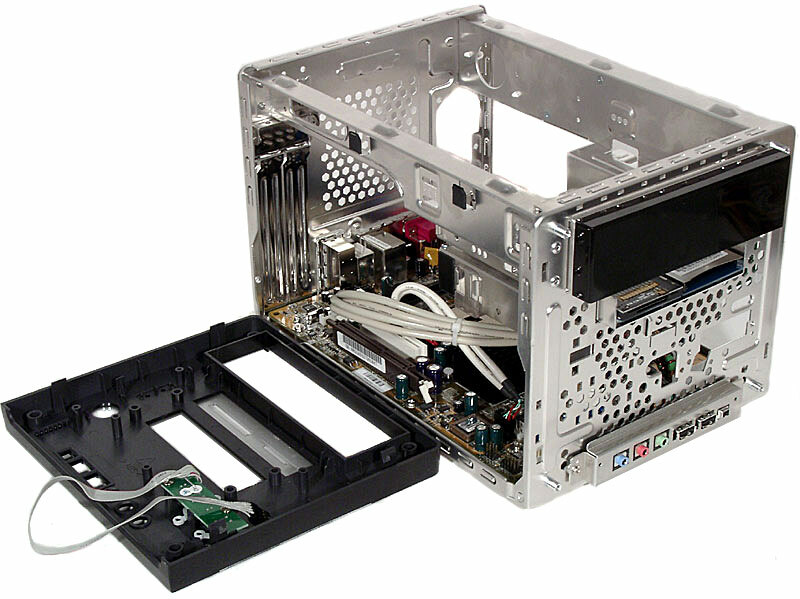 The SN85G4 case, as in most Shuttle XPCs, is made of aluminium. The cover is black and has usual stamped vent holes, not a grid like on the "elite" SB75G2. 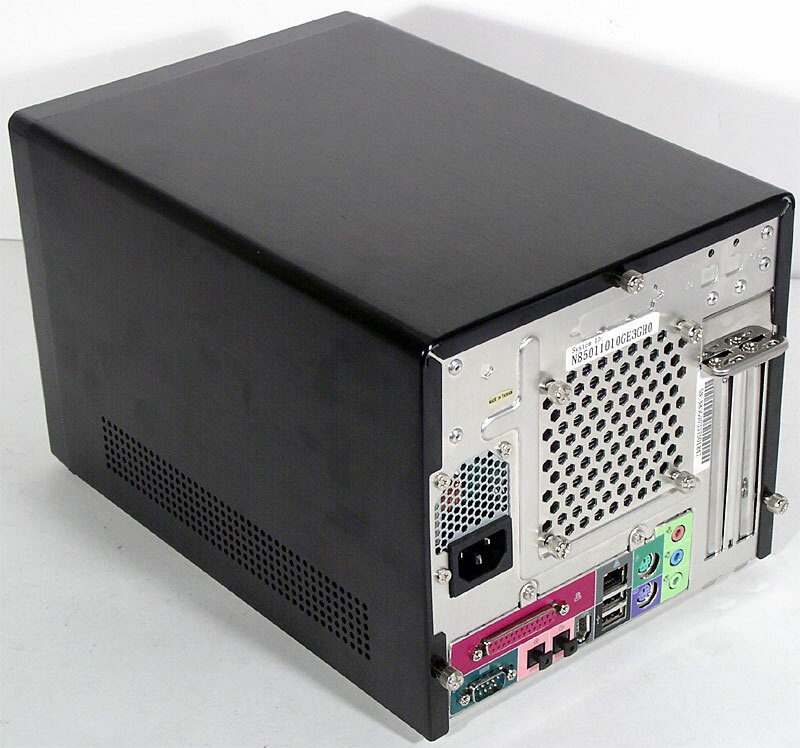 Case dimensions are also standard: 200x295x190 mm (WxDxH), it is a typical "cube" with a 5" bay. The differences start with the front panel. The absence of a floppy drive leaves a single external bay and makes the middle part homogenious. It is a transparent plastic plate with a silvery background. The main part of the panel is made of black plastic and has ornamental cavities for interface connectors and 5" bay output. In general, the front panel design seems a bit dubious: if you buy a CD/DVD-ROM with a black front, it's alright, if not  then the barebone will look too clumsy (it wouldn't be so striking in earlier Shuttle XPC models). Because there is no optical storage device, the external bay is covered with a standard bracket. The 3" bay for the pre-installed card-reader has slots in plastic that allow flashcard insertion and ejection. 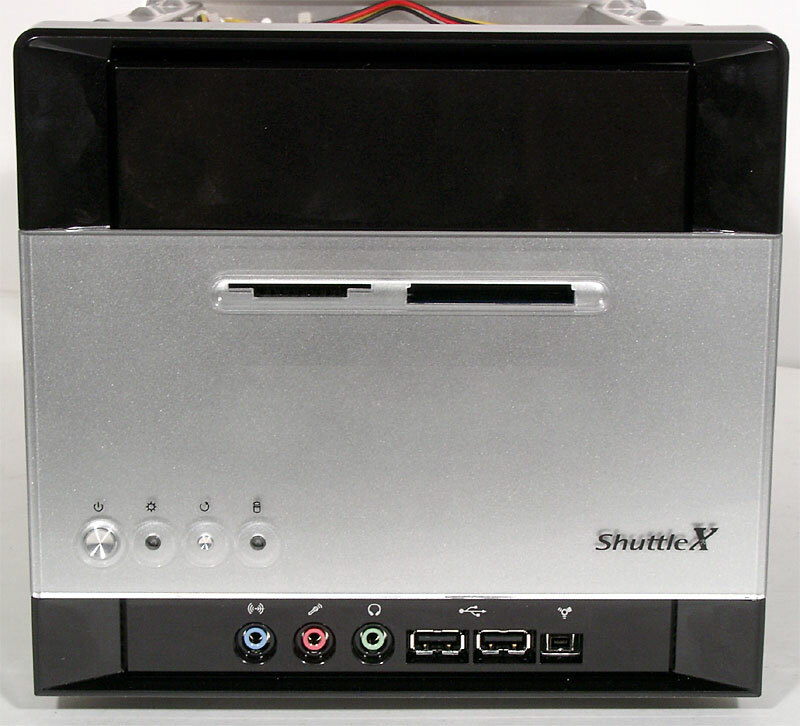 By the way, Shuttle also offers another SN85G4 version (to order)  with no card-reader and a solid front panel. Now let us examine the barebone's control elements. They include power and reset buttons, a blue power-on LED, and an orange HDD-activity LED. The model is supplied with a standard set of interface connectors: three Audio (Head Out, Mic In, Line In), two USB ports (2.0) and a mini-FireWire port (4-contact, without power). The back panel surprisingly has parallel and serial legacy ports that are still needed. The rest is not at all unexpected: two PS/2 ports, a 6-contact FireWire, a LAN, only two USB ports (2.0), three audio outputs for 6-channel sound (noteworthy, Mic and Line Ins are only in the front panel), and optical S/PDIF-In/Out. The abscence of a video output is not surprising, as integrated-graphics chipsets for the Socket 754/940 platform are not yet in use. (The alleged reason is that a too long "way to the memory" reduces sharply performance of K8-based systems with an integrated graphic core. Anyway, K8M800, unique in its kind, still has no boards.) Two bracketed outputs for extension cards indicate that the new barebone has no less interface slots than usual. Grids that face hot air from the chassis and the PSU are placed conventionally, although the abscence of a fan on the way from the power unit is astonishing. To see the inside of SN85G4 you have to unfix three thumbscrews and remove the cover. You can see from the photos that the inside of the chassis has changed (comparing to older Shuttle XPC models)  it no longer has a disk basket. When testing Iwill barebones, we noted a very convenient method of disk-fixation: they are fixed right to the chassis. Shuttle is now using this method in a slightly modified way: two upper disks are fixed to the supports while only the third (the lower) one, absent in Iwill XP4/-G, is placed into a removable basket. You can easily put it in place using skids and notches in the bottom of the 3"-bay "box", and then screw it with two bolts. The pre-installed card-reader is compatible with flashcards of CF I/II (and MD), SM, SD/MMC, and MS formats, that is, has a 6-in-1 formula. And not only can it be connected by the USB 2.0 interface, but it is also capable of developing a proper speed. But the barebone has a disadvantage too: the card-reader is connected to the inner USB port, limiting the user to the four USB ports of the front and back panels (or forcing him to buy an additional PCI-controller). Of course, if you don't need a card-reader you can replace it with a second HDD, but in this case, we recommend to order the slotless SN85G4 version. 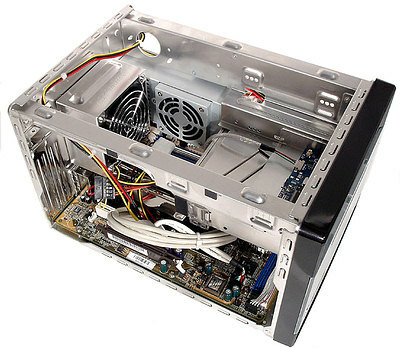 A larger-than-usual PSU occupies almost the whole right wall of the barebone, and its fan is side by side with the fan and the upper heatsink of the CPU cooling system. The AGP slot runs along the left wall, ruling out the use of videoaccelerators with a "double width" cooler (we strongly recommend to use a passive-cooling model). 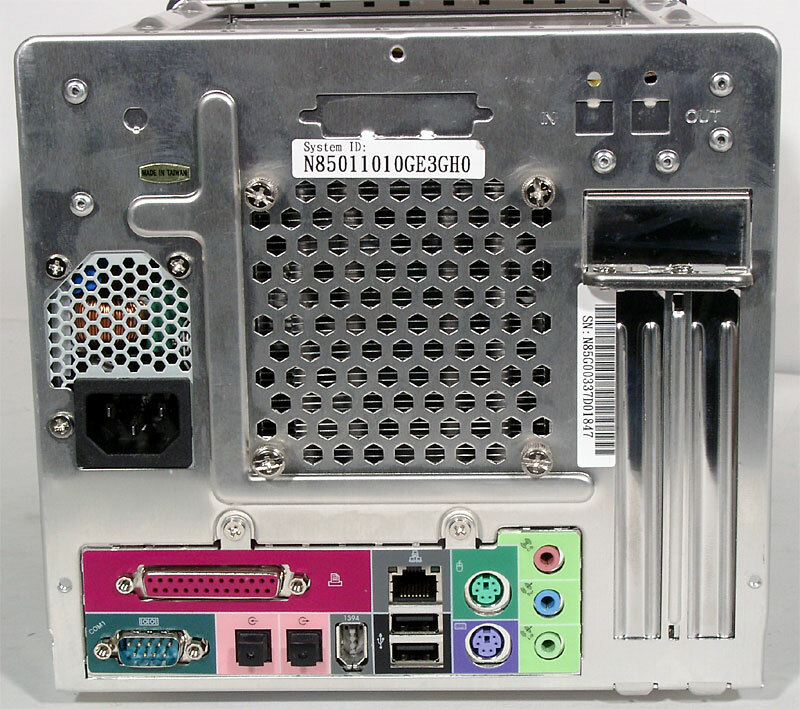 Somewhere in the centre, there is a PCI slot allowing the insertion of either a short card (under 13 cm) or a low-profile one. Otherwise, the card will rest against the HDD. Unfortunately, we can once again observe a cable helter-skelter, typical of Shuttle XPC. Which makes us wonder if it is really so difficult to measure a necessary cable length in order to avoid squeezing cable loops into the case. Besides, the motherboard connectors for the front-panel ports are located closer to the back wall, which makes the helter-skelter all the more complicated. We can note that is it quite easy and convenient to mount and update the computer. class="style2">DIMMs can be installed without PSU removing, access to the HDD is possible right after the removal of extension cards, and the upper 3" bay is accessible after CD/DVD-ROM unmounting. Although, you'll have to clear a lot of room when placing or replacing the CPU cooler. And if you overclock too high and need to clear CMOS, it won't be so easy, as the jumper is almost at the centre of the motherboard. 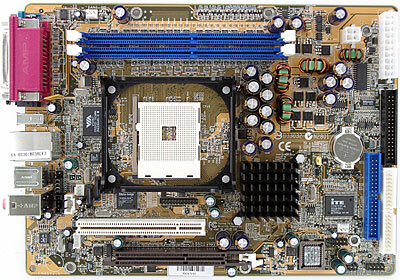 The motherboard used in Shuttle SN85G4 is code-named FN85 and is based on a single-chip chipset :) NVIDIA nForce3 Pro 150. 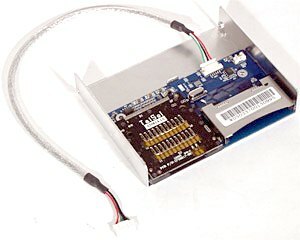 On the SATA board, the cooler's functionality is widened by a Silicon Image RAID-controller (SiI3512) and a VIA VT6307 FireWire-controller. So the system's specs look as follows: it supports AMD Athlon 64 CPU and Socket 754, up to 2 GB (2 modules) of memory DDR200/266/333/400, the AGP 8x bus, 2 SATA ports with a possible organization of level 0 and level 1 RAIDs, 2 UATA133 channels for 4 devices, 6 USB ports 2.0, a 10/100 Mbps Fast Ethernet (PHY controller Realtek 8201BL is used), 2 FireWire ports, and a 6-channel sound (AC'97 codec Realtek ALC650 is used). The board also has an IrDA header, CD-IN, mini CD-IN and AUX-IN connectors, a header for 2 USB ports (busy with the card-reader), and 3 connectors for fans. Note also the interface FDD connector: with an appropriate power cable it enables to connect a floppy drive, though there is no room for it in the case and you'll have to use it with the cover off. This seeming anachronism is, in fact, the only way to "shove" the SATA controller's drivers to the Windows 2000/XP installation program, if you use only one HDD (with the SATA interface). Using the RightMark Audio Analyzer 5.2 test program and the Terratec DMX 6fire sound card, we have estimated the quality of the integrated sound solution in the 16 bits/44 KHz mode. Total: Very good (more details). As you can see, sound quality is up to the mark despite an out-of-date audiocodec. Those who are unsatisfied with one of the top CPU's performance, can make use of BIOS overclocking settings. BIOS Setup enables to change the memory's basic timings and to set its frequency. You can increase the FSB frequency up to 280 MHz with a 1-MHz step if AGP/PCI frequencies are set  separately from FSB  between 66 and 100 MHz (also with a 1 MHz step). You can also increase the CPU voltage (from 0,8 V to 1,7 V with the 0,025 V and 0,05 V steps), the voltage of the memory (2,7, 2,8, 2,9 V), AGP (1,6, 1,7, 1,8 V), the chipset (1,7, 1,8, 1,9 V) and HT (1,3, 1,4, 1,5 V). SN85G4 uses a new PSU model which is different from standard ones in the following aspects. First, it is more powerful (240 W against Shuttle's 200 or 220 W). Second, its inner fan is not placed at the back panel, but in the middle of a side wall. 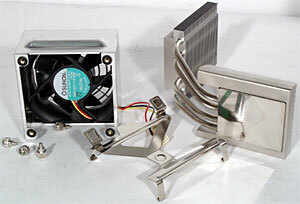 This obviously enables a more effective heat expulsion as the fan is right under the lower heatsink of the CPU cooler. But it also leads to the following side effect: the air from the PSU besides passing through the pack panel grid also comes through other CPU ventilation holes. Such heat circulation increases the temperature of the computer's front part where it is high as it is due to disk storage units. 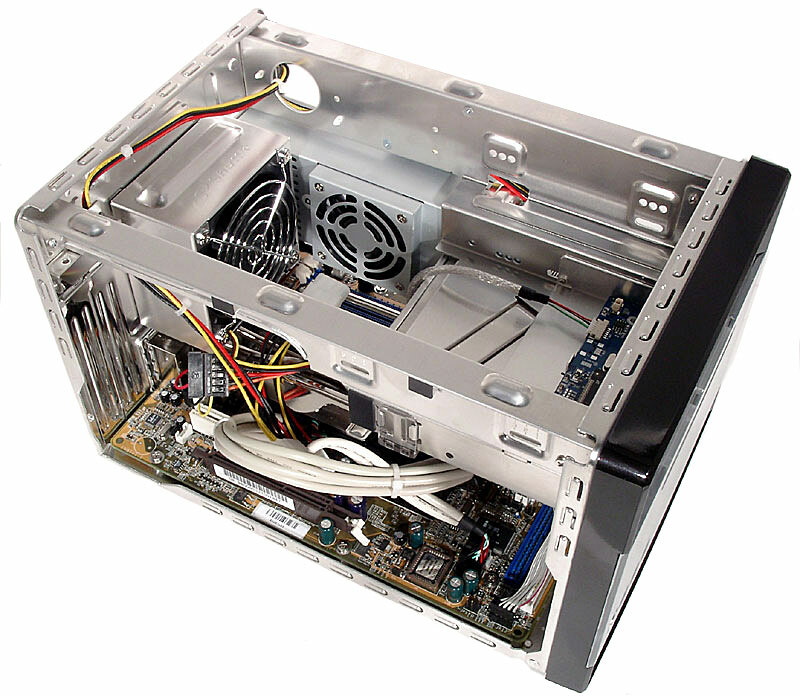 According to a number of users, the PSU internal temperature often exceeds 80°C at a full system load! 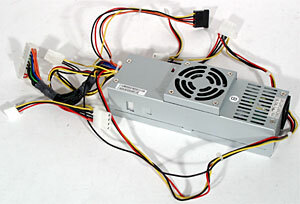 In respect of PSU's functional capabilities, we can point out a power cord for SATA disks, 3 standard HDD connectors (plus one for videocards requiring additional power) and two 2 cables for floppy drives. As the CPU cooler, Shuttle SN85G4 uses the I.C.E. system, standard for all company's barebones. The system's functioning has been repeatedly described, so just in short, the cooler's work is based on the heat-pipes principle. It only uses one 80-mm fan (of Sunon make) which blows the air through the upper heatsink. The cooler impeller rotates at ~3800 RPM, but like in other Shuttle XPC models, BIOS implements a "smart" control of the parameter. While the temperature is below the strictly-set limit of 78°C, the fan can rotate in one of the selected modes: ultralow (~2000 RPM), low (~2600 RPM), moderate (~3000 RPM), and maximum. When the threshold is exceeded, rotation frequency rises automatically to 3800 RPM. But there are also two "smart" modes: "quiet" and "safe", where BIOS goes through various rotation frequencies to choose the one fitting the CPU temperature (transition thresholds are 70/74/78°C in the "quiet" mode, and 56/67/78°C in the "safe" mode). We tested our system in the former one, as it is the only mode with the barebone noise low enough to leave the computer switched on in the bedroom or in the nursery. Fortunately, despite using top CPU, videocard, and HDD, we couldn't exceed the 70°C temperature. The diagram not only shows the temperatures of the system's basic components at idle and burned positions, but also compares them to Shuttle SB75G2 with a Pentium 4 3,2 GHz CPU. Such comparison is quite correct as the given Intel CPU dissipates even less heat than Athlon 64 3200+ (82 W against 89 W), and all the rest components were the same (except, of course, the motherboard). With I.C.E. set to the "quiet" mode, the test result was 70°C of the CPU core at a full load. A louder "safe" mode gave 60°C. And if you're interested in temperatures at a relatively low load, use the whole power of the Cool'n'Quiet function (set in new AMD CPUs). For this, you'll have to install a CPU driver and set the OS to the corresponding energy-consumption mode. In this case an idle CPU cools down to 35°C. However, high temperatures of the PSU and MOSFETs in CPU VRM overshadow the glorious picture and can make you feel like exchanging silence for a more effective cooling. What is good, is that even a very fast and hot HDD (like WD Raptor we used), can't overheat in SN85G4. At least, until it has a cold card-reader, not another HDD over itself. 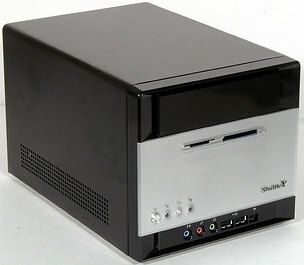 The SN85G4 package is standard for Shuttle XPC models. But for an amazing cooler, there would be nothing at all to look into the box for. 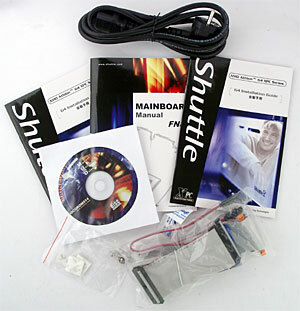 However, Shuttle does offer a wide variety of optional accessories, only they are sold separately and cost quite a sum. To conclude, we will give some brief specs of the package, shipped in a beautiful cardboard box with a plastic handle. Our previous tests had shown that chipsets for Athlon 64 (/FX) CPUs had one and the same speed, and so we took one of the fastest boards for Socket 754  Albatron K8X800 Pro II on the VIA K8T800 chipset. Because Shuttle SN85G4 has no integrated graphic core, our task becomes easier: we only want to confirm that a barebone motherboard is not any slower than full-size desktop ones. However, the fact that the system couldn't be started at minimal timings made us think that Shuttle FN85 would have a somewhat lower speed. And indeed, memory read latency test confirmed that 2,5-2-2-5 is worse than 2-2-2-5. But what will be the difference in real applications? Luckily, it doesn't surpass 3%, even in the most performance-dependent modes. The same thing with games, so there's nothing at all to worry about. And you can also see performance fall because of integrated sound activation. 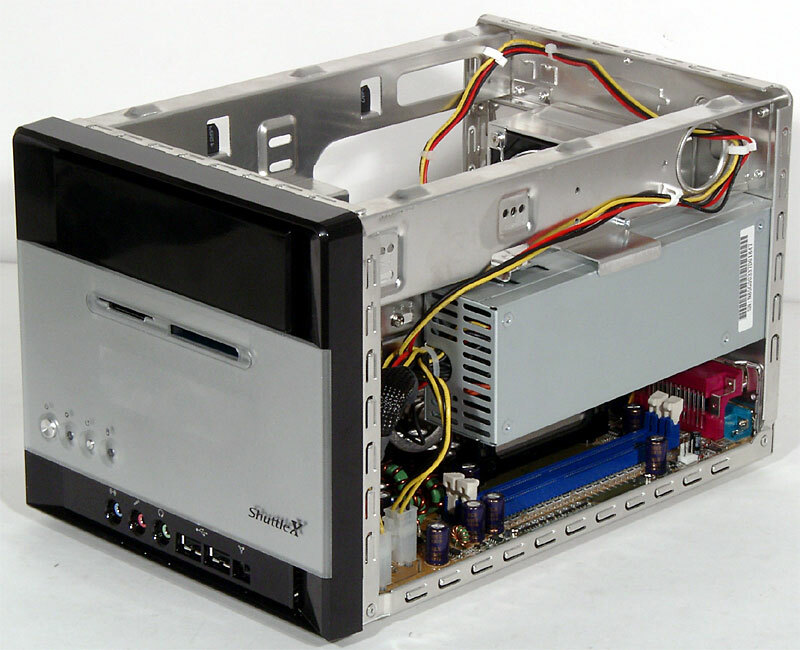 Because there is no wide choice of barebones for Athlon 64 on the market, Shuttle SN85G4 assessment should not be based on a better/worse principle, but rather on a suitable/unsuitable one. However, the model could surely be appreciated by customers even if it competed with others. Its "pros" are: a stylish (though peculiar) design, quiet functioning without overheating, and a very high performance (with additional overclocking potential). 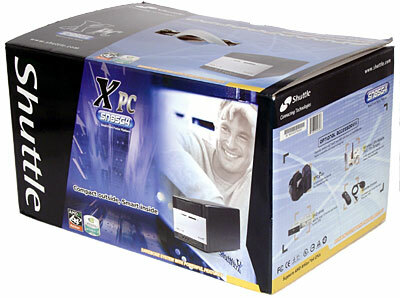 Like other Shuttle XPCs, it is not cheap, but at least it's about 50 dollars cheaper than SB75G2, a top product for Pentium 4, which, by the way, has no integrated graphics either. To conclude, we list the barebone's most important advantages and disadvantages.